Find Cheapest flights to Pune starting from CAD 1310 on Air Canada departure date: April 15, 2019, return date: April 28, 2019. The routing is via Mumbai (Bom) on Air Canada. Grab this flight deal to Pune before this is sold out. NanakFlights Customer Reviews - We are RATED 4.5/5 (84%) by 1180 google reviews. Pune is the fastest developing city in Maharashtra, India . It is becoming the commercial hub of Maharashtra after Mumbai. Planning to visit Pune, We partner with many Airlines to help you find cheap flights to Pune, India. Special $10 Gas Card Offer on flights to Pune! Nanak Flights is promoting flights to Pune, India, with a special $10 gas card offer. All tickets purchased before Dec 31, 2019 to Pune (PNQ) will receive CAD 10 gas card. India is a land of various religious beliefs. It has numerous travel destinations that people can visit to experience these cultural differences. One such location that we are going to talk about in this article is Pune. It is situated in the Indian state of Maharashtra and is the second largest city in the region. Pune was once the center of power for the Maratha Empire and is now the seventh most populated city in the country. During the 18th century, Pune was also considered to be a political center of the Indian subcontinent. In a real sense, Pune is supposed to be the cultural capital of its state. Apart from this, Pune is also very popular due to the various universities, and educational centers present its premises. That is one of the reasons why it is known as the Oxford of East. On the other hand, Pune is known for its manufacturing, automobile, and information technology related industries that also support the economy of the city. If you are looking to visit a place that showcases true Maratha culture, then Pune should be on top of your list. Here are few essential details that you would require to make your trip to Pune worthwhile. If this is your first trip to Pune, then it is essential to know when is the right time to visit. Monsoons are considered to be the ideal time to visit the city as the area surrounding its landscape turns into one of the most scenic views. Apart from this, the months between October to March are also pleasant enough to spend time in the city. Summers should be avoided entirely as they are boiling hot. Also, during the peak seasons, you can still find cheap flights to Pune easily. Travelers can easily find cab services provided by private companies while they are visiting the city. There are numerous service providers that you can hire for pickup or drop rides. In case you want to hire a full or half day cab then that too can be arranged by the same companies. Apart from this, these cab services also have unique tour packages that can be booked if you want to check out all the attractions of the city. Most of these services can be arranged through online applications as well. Another way to take care of your local transportation needs while you are in Pune is by riding the buses. These buses are mostly run by the state government and are available throughout the day. Also, the bus stops are located throughout the city after every kilometer so that it is easy for travelers to fetch a ride. This travel option is ideal if you are planning to travel short distances. One of the most historical landmarks that you can find in Pune is Sinhagad. It is a hilltop fort which is also a temple. The fort was built in the 17th century and has a temple of goddess Kali. It was built as a memorial for the emperors of Maratha empire. Another symbol of Maratha empire is Shaniwar Wada. It is an 18th-century fort made by Peshwas. The highlight of this fort is its large gates which are of big enough to let an elephant pass. The architectural style of the fort reflects Maratha culture in its true self. 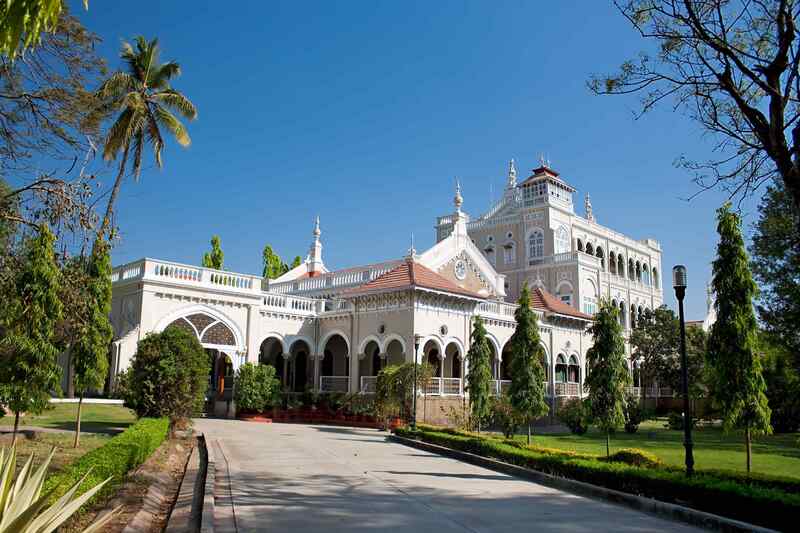 This palace was built in 1892 by Sultan Muhammad Shah Aga Khan III. It is considered to be one of the most significant landmarks in Indian society and history. Apart from this, it is also known as the prison where Mahatma Gandhi was held captive. The palace has also been designated as a world heritage site. In case you are someone who loves artifacts then Raja Dinkar Kelkar museum is a must visit. It showcases Dr. Dinkar's collection of objects in a three-story building. The museum houses more than 20,000 pieces of Indian artifacts in total. It includes everything from toys to paintings dating all the way back to the 14th century. Pataleshwar is a Hindu temple which has been carved out of rocks. The temple is dedicated to Lord Shiva and is a popular tourist attraction due to its architecture. It was built in the 8th century and is surrounded by a beautiful landscape. A great way to spend your entire day while you are in Pune is by visiting the Rajiv Gandhi Zoological Park. The park was established in 1999 and has more than 400 animals in total. Some of the animals that you can see while you are in the zoo include white tigers, Bengal tigers, sloth bears, leopards, and elephants. There are many markets that one can find which deal in foreign products. Hongkong Lane is one such shopping destination where you can buy worldly goods at a low price. The market is located near Garware Bridge and is always crowded due to its exceptional product variety. One can find everything here including clothes, perfume, accessories, and even jewelry. Another excellent low budget shopping destination that you can visit in the city is Fashion Street. Here you can find readymade garments and shoes in abundance. There are more than 500 stores in this market that deal in every latest fashion accessory that you see in the world. If you are someone who loves antiques and are looking for old things, then Juna Bazar is a must visit. The market is open only from Wednesday to Sunday, and it is situated near the Vir Santaji Ghorpade Road. It is the best place to buy antiques for a reasonably low price so that you can create your collection. Visiting Pune and not trying Marathi cuisine is one of the biggest mistakes that you can make. An ideal location to try out this type of cuisine in is the Maratha Fine Dine. It is located at Shivaji Nagar and is easily accessible from the central part of the city. Although, not very Indian but Little Italy is an ideal place to try international cuisine. It is a chic and contemporary chain of restaurants that serve traditional Italian dishes. The restaurant is located near Ganesh Khind Road and is open until late night. If you are craving European style food, then the best place to visit is Le Plaisir. It is located in the central part of Pune and is known for its cozy and casual ambiance. The restaurant opens early in the morning and is also known for serving European breakfast. Major airlines flying from Canada to Pune (PNQ), India. Jet Airways flies to Pune via Amsterdam hub and then connecting via Delhi and Mumbai. Air Canada connects via Mumbai and London airports. Lufthansa connects via FRA (Frankfurt) airport. United Airline connects via US airports. United Airline allows 1 piece of baggage for Pune flights. KLM Operates the flight by AMS (Amsterdam airport) and connects via Mumbai airport to Pune. Air France connects via its Paris hub and then connects via Mumbai using Jet airways code share flights. Air India connects via LHR airport. Etihad airways connects via Abu dhabi hub. We at, Nanak Flights, offer best deals on airline tickets to Pune from all Canadian cities including Toronto, Montreal, Ottawa, Vancouver, Calgary, Edmonton, Halifax, Winnipeg, Fort Mcnurray all around the year. Use our flight search engine to compare top airlines at the lowest prices from the comfort of your home or office. If the cost of your air tickets drops after you purchase your tickets from us, we'll give you up to CAD 100 credit to spend on the next flights you book with us. Our Secret to cheapest airfares to Pune is connecting with multiple suppliers and multiple GDS (Global distribution systems Sabre, Amadeus) to shop the lowest fares and offer the cheapest fare to our consumers. cheapest tickets from Toronto(YYZ) to Pune(PNQ) departing May 11 2019, returning May 30, 2019. Fares are subject to availability. We update our seat sale fares regularly. Please check our web site for most up to date seat sale fares to Pune. For any information regarding Pune International Airport, Please visit the Pune International Airport web site. We are RATED 4.5/5 by 1180 Google reviews for a reason. Book your Flights to Pune with confidence with us.